You know that a Shakeology shake is a great addition to a healthy breakfast or as a tasty snack when you feel yourself getting hangry. But sometimes you’re in the mood for a smoothie bowl — something healthy and delicious that you can really savor and take your time enjoying. 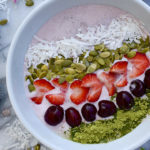 With toppings like frozen cherries, sliced strawberries, shredded coconut, and raw green pumpkin seeds that mimic spring leaves, this is definitely an Instagram-worthy breakfast or snack. Don’t forget a sprinkle of emerald-green matcha to make the color palette even more stunning! This Cherry Blossom smoothie is made with Shakeology, cherries, strawberries, and more. Place water, almond milk, Shakeology, half of the cherries, matcha, and ice in blender; cover. Blend until smooth. Place smoothie in a medium bowl. Top with remaining cherries, strawberries, coconut, and pumpkin seeds; serve immediately. If you love the flavors, but don't want to make a bowl, blend everything together to create a delicious smoothie! 2B Mindset Plate It!This recipe makes a great breakfast option.